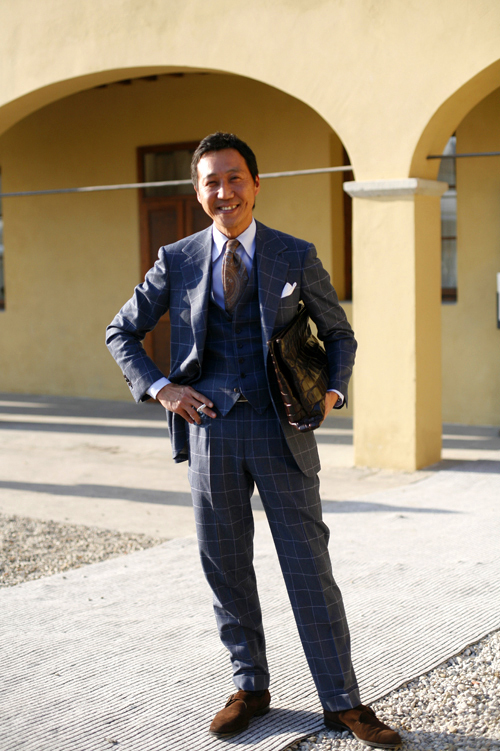 A vest on a three-piece suit can totally make or break a look. Here the vest is just the right length. Also, I love the paisley tie. I’m really feeling for paisley right now, I hope Etro comes back from being so over-the-top and gives me some truly elegant paisley items (ties, scarves, etc) that don’t have wacky contrast colors as the backing. Ey-oh, Sart! Lots of pics today! I’m not into the pattern but am into the fact that he likes this outfit. The animal leather (croc?) with suede is interesting. And where do you hang out that so many people smoke? Even Montreal isn’t that bad! I like that the colour palate of the tie also matches the shoes. Gorgeous colour/pattern/texture mix, but the tapered cut to the trousers, not so much. Like the windowpane check and suede shoes, but must disagree about the vest which, in this pose at least, seems to me too short. Also, the pants seem too generously cut in relation to the jacket, which is very slim–see their highish rise, for example. If you look at the pants width, then look at that of the sleeves, you’ll see what I mean. But, a nice job of ensemble-making, nonetheless. Actually the vest is a whisker too short, as you can see the buckle of his belt poking out below. This raises the issue of whether it is better to wear suspenders with a vest, but even if this gentleman had gone this route the vest would still have been a tad short. The comments by other posters about the ultra slim cut of the pants are also accurate. Simply too much. I like the windowpane, a very underrated look in my opinion. Not a big fan of the vest on this gentleman I believe he would’ve been better off without it. As for Etro, interesting that you should mention their over the top-ishness. I was discussing the same thing with a friend, they’re always good for a few pieces but require the balance of a less outlandish line. Great photos, Sart. By the way how did you manage to stay warm during fashion week? My sister mentioned that the tents were quite cold and people were asked to remove their coats. I am glad you are as obsessed with paisley men’s scarves and items as I am. I have recently been trying to build up good items. The irony about Etro being the only one to produce good paisley is that this is not originally an Italian pattern, but an Indian one by way of London. The paisley “tears” actually represent mangoes in Indian textile production. The pattern was imported to London via “Liberty’s of London” which still stands in its historic building, but, at least the last time I was in town and went to check, does precious little for men in paisley. (A lot of floral prints and ties, but little paisley and the only paisley scarves they had were by Etro!). An alternative to Etro is Paul Smith. I have found them to have some pretty good silk scarves for men and for women in tastefully sized and colored paisley print. Indeed, the fit is perfect, and each piece is individually beautiful, but I don’t like the overall look. I don’t like the color scheming. The suit would look better with darker shoes. Black, perhaps. Or maybe red. Same with the tie. Agree on the Etro note… I have some great ties and scarves from 1999-2000 that look so subdued now, next to the bright colors they seem to favor now. You almost need your shades to look at some of their shirts! He is adorable. If I saw him on the street, I’d ask him if I could take his picture. I really like the look of the vest, and the three piece suit in general. They’re not as popular as I’d like, so when you see a good one its really brilliant. I also love his shoes, so jealous. The pattern of the suit is ok I guess…for an older man. However, I still think the light grey windopane could have a bit less contrast with the rest of the suit. Its a bit too bold. 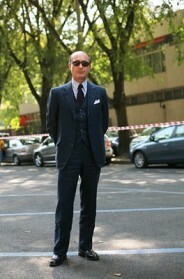 I adore three piece suits, however. Suit is 100% but his belt buckle is showing under the waistcoast, that is bad form. Actually, he should not be wearing a belt, should have ihs tousers cut higher with no blet to spoil the affect. An why is his waistcoat top button undone? If you are interested, this guy is Mr Kamoshida, Kamoshida Sama, the Creative Director of United Arrows, a truly stylish place to shop in Japan…. Check him out in the latest issue of Men’s Ex…. It’s always nice to see a three-piece suit. The waistcoat may appear a little short, although this could be due to the lowest button being left unbuttoned (very traditional), causing the waistcoat to ride up slightly. The suede monkstraps look marvellous and fit very well with the suit – is it flannel? All in all, another inspirational image.